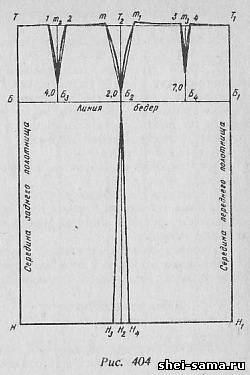 Despite the variety of skirts the other form, their drawings are based on drawing a straight duhovnoi skirt (Fig. 404). In the drawing the main dimensions of the shape are poluobhvat waist (St), poluobhvat hips (Sa) and length (Du). A typical figure of this size is determined by the following data: St = 38 cm; SB = 52 cm; Du = 75 cm Increase in free fit for all sizes of PT = 1 cm; PB = 1 cm. Builds a right angle with the vertex at point T. Segment T corresponds to the length of the skirt is the middle of the back of the cloth. The position of the hip line in the drawing is determined by the period TB. TB = Tsp 1/2 - 2 = 1/2 X 43 - 2 = 19.5 cm Interval TN is equal to 75 cm. Through the obtained point B and N to direct T restored perpendicular. From point B on the line of the hips is the cut equal to the measurement poluobhvat hips (SB) plus the increase in free fit at the hip line, a dot B1. BB1 = SB + Pb = 52 + 1 = 53 cm. Through the point B1 is the vertical line corresponding to the line of mid front cloth skirts. It intersects with the bottom line at the point H1. From point B to the right on the hip line is delayed a period equal to half of the poluobhvat hips plus the increase in free fit minus 1 cm is the point B2. Through the point B2 is a vertical line that intersects with the bottom line at the point H2 and waist at the point T2. In the drawing duhovnoi skirt decided to do three tuck. The difference between the width of the skirts at the hip line and the waist taken in a tuck. Amount = (SB + SP) - (St + PT) + fit. Amount = 53 - 39 + 0,5 = 14.5 cm. Solution side tuck equal to half the sum of the solutions of Darts (7.2 cm). From point T2 on both sides is delayed by half of the solution side of the tuck, put the points t and T1. Т2т = т1Т2 = 7,7/2 = 3.6 cm. From point B3 is restored up perpendicular to the intersection with the horizontal line drawn from the point T is the point T2. Solution back tuck = 0.3 amount of Darts. From the point T2 to both sides at the waist line is delayed by half of the solution back tuck, put point 1 and 2.
is Determined by the position of the front tuck: Б2Б4 = 0.4 x Б1Б2 = 0,4 x 27.5 = 11 cm. From point B a perpendicular is restored up to the intersection with the horizontal line drawn from the point T is the point T3. From the point T3 to the sides at the waist line is delayed by half of the solution front tuck. All the Darts are made of smooth vertical lines. The upper section of the skirt is made in a concave line patterns in private Darts. Line the bottom of the skirt from point D2 to the right and left delayed by 2 cm and the points N3 and N4 are connected with the point B2. Construction drawing of the model (Fig. 406). Enclosed in the contours of the main parts of the skirt applied to the hips. In the middle of the rear and front panels delayed 17 cm Width of the yoke along the side cut b see a line yoke. The length of the pocket 12 cm From the lateral edge front cloth along the Basque line is delayed 12 cm side cut down from the Basque line is delayed 22 see the line of the pocket. Welt pocket is made binding, slightly lagging. The width of the borders on the side cut of six inches, the yoke - 3 cm.Applied the size of the burlap pocket: Basque line 3 cm at the side cut of 4 cm. The patterns are cut along the line of the belt. Tucks at the yoke closed, and on the front panel tuck previously extended to the Basque line. Construction drawing of the model (Fig. 407). Enclosed in the contours of the main parts of the skirt applied to the hips. Parallel to the waist line back and front panels delayed 9.5 cm (width of the first yoke). The line of the yoke. Then parallel to the intended line of the first yoke is delayed 9.5 cm, the line of the second yoke. Patterns are cut according to the lines of the yoke, tucks on the yoke closed. Patch pockets are sewn at a distance of 9 cm from the line of the second yoke and at a distance of 8 cm from mid front cloth skirts. 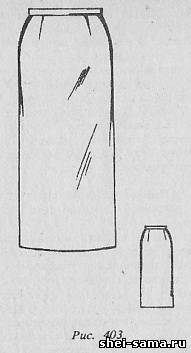 Size pockets indicated on the drawing. Construction drawing of the model (Fig, 408). Enclosed in the contours of the main parts of the skirt applied to the hips. Parallel to the waist line back and front panels delayed 14 cm (the width of the yoke). The line of the yoke. Parallel to the line of mid front cloth adjourned 8 cm (depth counter folds). 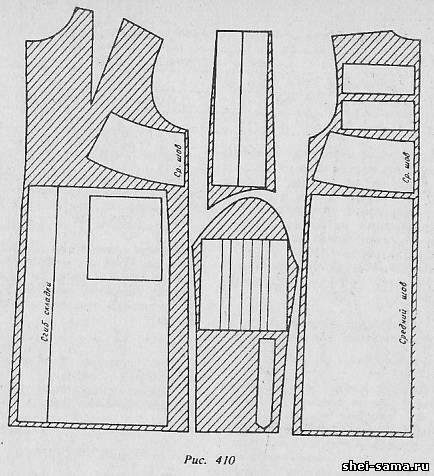 Size pockets indicated on the drawing. Patterns are cut according to the lines of the yoke, Darts closed. Construction drawing of the model (Fig. 409). Enclosed in the contours of the main parts of the skirt applied to the hips. Tuck on the front panel of the skirt is not fortified. From the middle of the front cloth to the left waist is the cut Т1т2 equal to 15 cm. side cut down from the waist line is delayed a period equal to 18, see the Line of entry into the pocket is made with a smooth curve. The depth of the tuck on the front panel of the skirt at the waist т2т3 equal to 2 see the Second side of the tuck is made to smooth the curve, repeating the lines of the pocket. In the manufacture of skirts you should consider the following. The fabric is carefully examined to see if there are burnt areas, abrasions. Laying out parts, it is desirable to consider the direction of the warp. 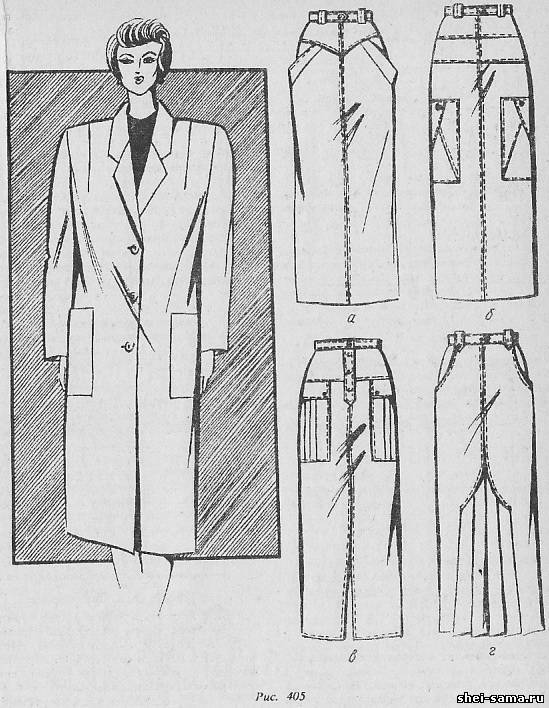 If the skirt is made from raincoat (male or female), details can be decomposed as shown in figure 410. In each case, depending on the model can have its own layout details of the cut.